Nvidia’s 28nm Kepler GPU architecture along with possible specifications of the GeForce GTX 600 series has been detailed and pictured by BrightSideofNews. Another set of details were exposed yesterday which showed that Kepler would feature 1536 stream processors, No-Hotclocks and a 256-bit memory controller on the GK104 chip. The new GK104 based GPU would be a replacement for the GF-114 based GTX560Ti at a price range of 349-399 dollar and would be known as the GeForce GTX680, Early performance figures show that the card would not only outperform the $449 Radeon HD 7950 3GB, but also flagship $549 Radeon HD 7970 and NVIDIA’s current GeForce GTX580. How would Nvidia churn up such huge performance numbers from a Performance Tier Card? 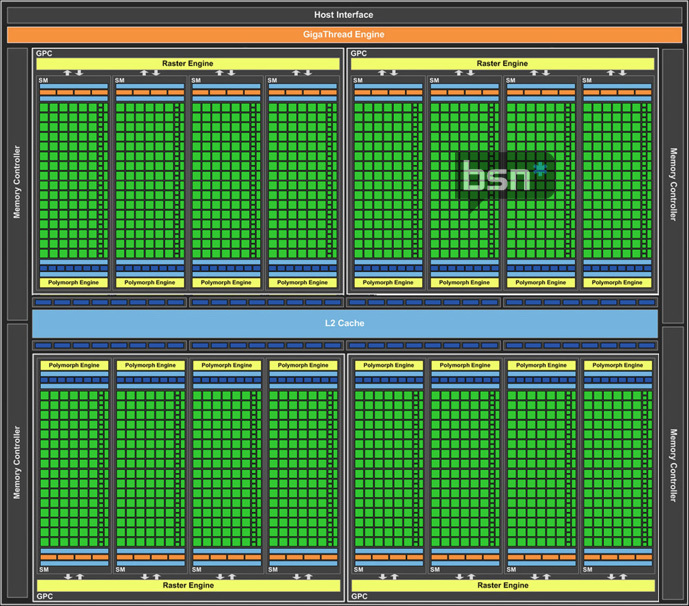 Its simple, By adding a whooping 1536 Cuda Cores containing four streaming multiprocessors. This suggests that the Core count on Nvidia’s Next Generation Kepler GPU’s can be something like this – 96 (1SM), 384 (1GPC), 768 (2GPC), 1536 (4GPC), 2304 CUDA cores/Stream Processors (6GPC). Memory controller should be something like 64-bit low-end, 128-bit mainstream, 256-bit high-end and either 384-bit / 512-bit. The GK110 based part would be the High (HPC Tier) chip featuring either a 384-512 bit memory interface with 2304 Core Count. Details also show that Nvidia’s next dual chip card GTX690/790 would actually be based on a Single chip featuring a monstrous die size and probably double the core count of Gk110 – 4000+ Cuda Cores (512/384 bit x2). GK104 based graphics cards would at that same time feature a similar fixed-function logic as the AMD’s Tahiti cards such as 32 Raster Operation Units and a 128 Texture Memory Units. The GK104 would come in two parts as told earlier by SemiAccurate, the GeForce board will run double-precision at one quarter rate – while Quadro and Tesla will run at half-rate. The site has also revealed the clock frequency of the GK104 product to be 950Mhz while samples running in Nvidia’s labs are clocked at 772MHz for clock-per-clock versus GTX 580, 925MHz for clock-per-clock versus Tahiti XT, Retail parts would ship at 950-1000Mhz Frequencies. Even if NVIDIA doesn’t touch the 1Ghz mark, expect factory overclocked variants to reach that kind of speeds. The only downside remains is the 2GB memory buffer compared to 3GB on AMD’s HD7900 Series however it seems fine since the card would be priced $100 lesser than its competing GPU’s. Memory would be a beast being set at 1.25Ghz Quad Data Rate (5Ghz Effective) resulting a 25% performance gain over Fermi. A 160Gb/s memory bandwidth is marginally better than the GTX560Ti (128.27Gb/s) and GTX570’s (170Gb/s). The release date of the GK104 is expected around Q2 2012 – April. If everything turns out to be true then that would prove the Gk104 Kepler would dominate the price/performance ratio in GPU market. Do check out the article over at BSN for more details!